Recently, the production facilities of New Products Group in the city of Zhashkiv started the packaging of a new SKU from the line of an innovative beer-based alcohol and energy cocktail Diablo™. Diablo Extra Alco Energy “Caffeine” has an original fruit and berry flavour of strawberries and oranges with the addition of a “special” ingredient – black pepper. Diablo™ is a sensational 2018 novelty. In August 2018, New Products Group introduced a completely new innovative drink to the market – a beer-based alcoholic energy cocktail with no added ethanol, where naturally fermented water, hops, barley malt extract, syrup, and yeast are used as the alcoholic base. Essentially, it is beer in terms of the production process, but after a special multi-level filtration, the product becomes devoid of the beer taste, smell, and aftertaste. “Our lab specialists always carefully select all the ingredients, tirelessly searching for the best combinations of tastes. And this is not just an abstract search for good flavour – the brand and its philosophy matter! Strawberries and oranges could very well have been a great “girly” fruit and berry cocktail. But this is Diablo™! Therefore, we added a pinch of pepper to the sweetness of berries and the sourness of citrus. The new Diablo Extra Alco Energy could use a little fire and brutality because that is what will help young and courageous adventure seekers to set free their own inner demon”, – commented Elena Chuvakina, Head of Brand Department at New Products Group. Diablo™ is a provocateur and a catalyst for those who want to find and reveal their dark side to the world. In each of us live an angel and a devil. Each has both a light and a dark side. Through the combination of an energy drink, which provokes a surge of strength, and relaxing light alcohol, Diablo™ helps to let your inner devil loose. 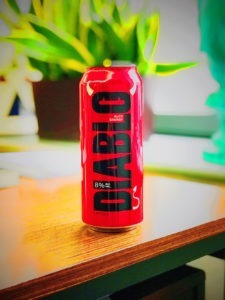 Today, the Diablo™ line includes two cocktails with 8% alcohol content: DIABLO EXTRA ALCO ENERGY “Caffeine” with strawberry, orange and black pepper, and DIABLO BLACK ALCO ENERGY with barberry flavor and light fruity notes in the aftertaste. Both SKUs are available in 0.5 l metal cans.